Sometimes you ride the road to adventure and sometimes the road rides you, which is exactly how I'd felt as I sat up and picked ditch gravel from my elbow and tall grass from my hair. All I'd wanted was a girls' weekend away from home, a sort of double bachelorette party for two of my friends who were both getting married soon. No guys, no kids, no restaurant. But right now, as I catalogedthe bumps and bruises, I only knew two things for certain: First, we were no longer in Reno, and second,Hell had a new name--Assjacket. 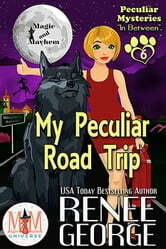 When human psychic Sunny Trimmel and her three best friends decide to go on a weekend getaway to Reno, they get away all right— into an alternate reality where cats talk, her Shifter friends are stuck in their animal forms, and they're dumped into a rural hell known as Assjacket, West Virginia. Thanks to a vengeful witch's magic gone wrong, the girls are sucked into one of the most peculiar adventures they've ever had. People and landmarks are disappearing all over town. 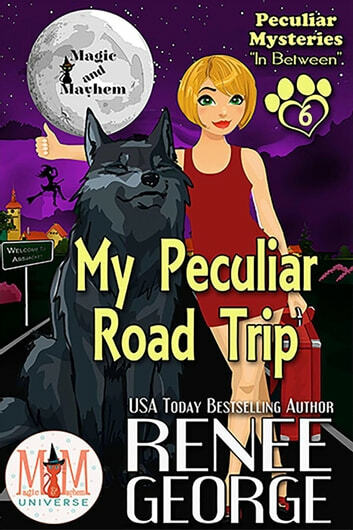 Sunny will have to rely on her faulty psychic visions, her friends, and the crazy townsfolk to solve the mystery—or they might never find their way home. Author Note: This is a Magic & Mayhem/ Peculiar Mystery Crossover. It can be read as a stand alone, and it does not effect the Peculiar Mysteries world timeline. I could not get through the first few pages.....oh dearie me. Sunny and the gang really took bachelorette partying to the extreme. I was pleased to see the direction this book took being it was part of the Magic and Mayhem Universe with characters that we have already grown to know and love. Maybe I should have suspected the turns but I didn’t. They story was a great addition without losing it’s heart.